Now that everyone and their dog pretty much has some kind of smart phone, living in a new city can be REALLY easy if you have the right apps at hand. Here are a few that I use often. Waze: It's the best GPS app right now, with turn by turn directions and pretty solid map capabilities plus alerts that can be sent out telling you if there's an accident, some traffic, or a cop catching people speeding. GasBuddy: A super useful app now that gas is up to $5 a gallon, it tells you the prices of gas nearby and can give you directions to the cheapest pump. IMDb: If you're going to live in LA and try to get into the entertainment business, you need to know what's up. IMDb is a good site for movie news and announces and the app can help answer the age-old question "where have I seen that guy before?" Your Bank: If your bank has an app (like Bank of America) GET IT. While you're far from your home bank and probably spending movie quite often with gas and food and coffee you're going to want to be able to keep a close eye on your funds. Pandora: If you're stuck in your car on a daily commute and don't appreciate the lack of diversity in the top 40 stations, get an ipod adapter for your car and play a Pandora station- it's far more enjoyable and the commercials are WAY shorter. These apps are also all free (Although I guess a specific bank app might not be, but that would be stupid) which is nice. Happy app-ing! So now you've been living in LA for a few weeks, you're taking classes and working hard at your internship--you deserve to have some fun. 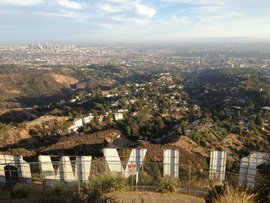 If, like me, you have never lived anywhere like LA before, here are some cool things you can do while you're here and have free time. 1. Go on some of the RA planned trips. These RA planned trips are probably way cooler than the ones your RA planned at Ithaca, trust me. The RAs this semester have put together a lot of stuff, from beach day trips to people going to see The Book Of Mormon. With big groups like this you can usually get discount prices and things are always more fun with friends. 2. 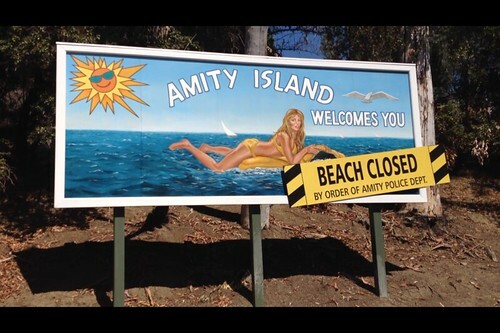 The teacher-planned trips aren't bad either. The professors out here want you to have fun! During the first week almost all the ICLA students went to a taping of the sitcom Guys With Kids on a nearby lot (we were the laugh track for the first and fourth episodes!) We got to go to a The Price Is Right special Halloween taping and had reserved seats for us front and center. So you should really check those daily emails that the teachers send out for events like this! 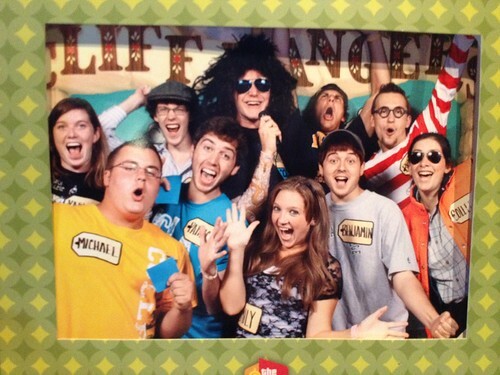 Ithaca College group at a The Price Is Right taping! 3. Late Night TV tapings. Keep an eye out for free concerts and tapings for late night TV shows; they happen quite often and some big name bands perform a lot. A friend and I got to see the Avett Brothers for free when they were on Jimmy Kimmel's show. We waited in line for only about an hour and ended up in the very front row. And the best part was that it was free! No money? No problem! 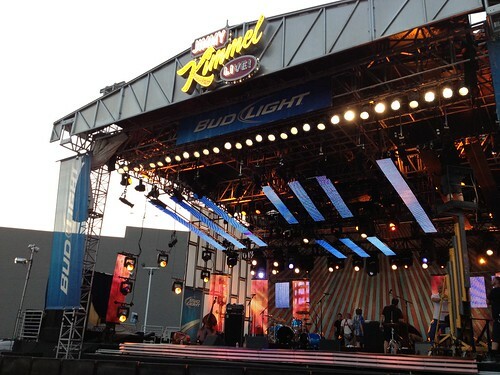 Front row at a free concert thanks to a nearby Jimmy Kimmel show taping. If you're a fan of sports at all, LA is a really cool city to go to a baseball game in. 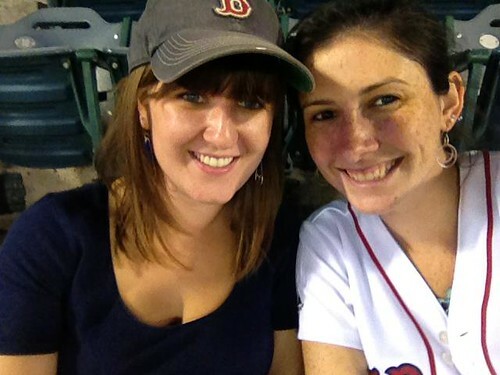 For less than $10 I was able to get my roommate and I tickets to see the Red Sox play against the A's. Though we were in the nosebleeds, the stadium was huge and really cool, and there were PLENTY of other Sox fans there. If baseball is your sport than I highly recommend it. 6. Shakespeare in the park. Also at Griffith Park is a Shakespeare in the Park group that performs quite often and presents a wide variety of Shakespeare's works. We saw A Comedy Of Errors and it was great, it doesn't cost anything, we were able to pack our dinner and have a picnic, and the actors are sincerely talented. If you like it you can go back as often as you like, it's always in the same place and if you get there early enough you can get a fantastic seat. Of course, you'll likely go to some amusement parts when you're here (teachers can usually get you discount tickets for these too!) Passes give you a whole two-days at the Universal Studios theme park and if you get a Six Flags ticket for the month of October you'll get to stay at the park after dark (until midnight) for "Fright Fest," where everything runs in the dark and haunted houses and mazes open up. I highly, highly recommend the October Six Flags Adventure -- it's fun, not terribly expensive if you get a pass through the school, and the only downside is that your legs might not love standing around all day... but it's worth it! Now if you say that you have nothing to do in LA, I'll know you're lying. There is plenty to do and the Facebook ICLA group generally has new daily invitations to comedy shows and big group events. There are a million ways to fill your time... enjoy!